Two Bears Farm and the Three Cubs: On Giving Birth Naturally, Drug Free, to Twins. The Birth Story. On Giving Birth Naturally, Drug Free, to Twins. The Birth Story. 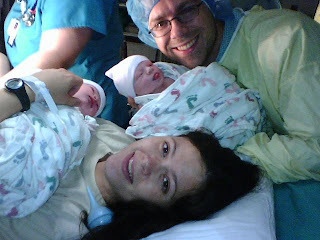 So as I have mentioned before, I wanted to write about my birth story because when I was pregnant with twins all people told me were horror stories. Everyone I met had something scary to say. Or at least that was how it seemed. 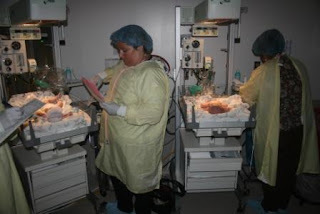 And I desperately wanted to avoid a c-section - yet out of probably 40 fellow twin moms, I only found one who had managed to deliver without one. So I want to write my birth story because YES, it is quite possible to give birth to twins completely naturally! Have a seat and settle in, this is gonna be a lengthy blog. At 2 am on August 8th (the day after my 13th wedding anniversary) I got up to pee. I was 38 weeks, 4 days pregnant. So I dragged my whale body out of bed (no small effort). When I sat on the toilet, there was a gush that was beyond the usual tiny preggo trickle of pee, and I knew then my water had broken. I called my mom and told her no rush, but she should probably head on over from Blacksburg (an hour drive). Then I hopped in the shower. Once I got out, the contractions started. Right away they were about 3-4 minutes apart. I grabbed one of Paul’s t-shirts and a pair of shorts and made my way down to the guest room to wake him up (he was banished from our room at the end because my sleeping was so poor). Every time I would stand up big gushes of water would run out. It was gross. I sat on the couch and waited. Our living room was consumed by the humongous tent that I'd given Paul as an anniversary gift. It took up the entire living room. It seemed like a very long time before my mom got there. The contractions were intense. She finally showed up around 3:20. In between contractions I made my way to the car. The drive to the hospital is about 20 minutes, but being buckled in a set position was kind of rough, as was the drive over our mountain – really bumpy! Contractions were 2-3 minutes apart at this point, and lasting well over a minute. Paul was getting very nervous and almost went airborne driving over a big hill on the way to the hospital. I was like, "Don't worry, slow down, I'm not going to deliver in the car!" Paul dropped me off at the hospital main entrance and went to park the car. Paul showed up then and they hooked me up to monitors to attempt to track the babies for 20 minutes. After 10 minutes I was making so much noise they decided to move me to a labor room, even though they hadn't done any of the admittal paperwork or put in the hepalock in case I needed an IV later. My doula showed up at this point. I was hot. Inferno hot. They told the doula I was 4.5 and she asked them to check again. They did and I was already at 6. I was moaning and panting and sweaty. I asked for ice chips and they showed up right away, thanks to an incredible OR nurse named Madeleine. All the sudden I started feeling the urge to push. It had only been like 45 minutes since I got to the hospital. I was starting to really get loud with verbalization at this point. I was gripping Paul’s hand, the bed, the pillow, anything I could wrap myself around. The doula asked the nurse to check me again and she said, “interior lip”. Crystal, my doula, said, "You're going to have these babies SOON!" Slightly delusional, I said, "Really!?!" They wheeled me down to the OR. With twins, there are so many opportunities for things to go wrong that they require you to deliver in the OR. I was still in my street clothes...I hadn't even had time to put on a gown. The on call doctor for my doctor’s practice was not there yet. This was the point where things got a little crazy for me. It was like my body became possessed. It started pushing without me…I was just along for the ride but along that ride I was doing these guttural yells that have taken over my body like something out of the Exorcist. It was like nothing I had ever experienced before…completely primal. The weird thing was...the yelling felt good. It was the only way of expressing the experience my body had I think. 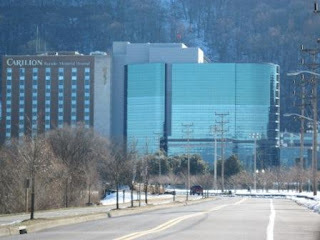 I heard the Crystal telling Paul (who was kind of freaking out) that the labor had gone so quickly that my body hadn’t had any time to make any natural endorphins and that I had no natural pain relief whatsoever. Meanwhile, the doctor hadn’t shown and the hospital was busy but the twins wouldn't be held back. So in came this young resident who had this look of surprise on his face. He said he was Dr. Johnson and looked a little pale but fortunately the on call doctor for my ob/gyn practice, Dr. Walsh, walked in right after him. I’d never met Dr. Walsh before but it didn't matter. Believe me, it REALLY didn't matter. They immediately got me into position to push. No stirrups. Crystal and Madeleine held my feet. My doula reminded me not to push too hard this time to prevent tearing. I was trying to find a balance but it was so hard to know. I could feel the ring of fire, something my doula said that most women don’t have their first pregnancy but feel their second, an indication that the baby is crowning. I was thankful to know what it was because it felt bad, but at the same time I felt focused. I was totally okay to push through it because I wanted the possession of my body (i.e. the screaming) to stop. I was pretty sure they could hear me in Alabama at this point. The doula told me to reach down and feel Baby A’s head. I felt him crowning. His head came out with his hand by his face, which caused some facial bruising. The rest of him slid out pretty easily. The relief was immediate, and I got to hold him on my chest right away. Paul cut the umbilical cord. Brave hubby! It was 4:52. The doctor gave me a couple of minutes and then I handed off Reid and Dr. Walsh broke the water of Baby B. The doctor told me I need to go ahead and push out Baby B right away. Thankfully, he was head down (if you'll recall, he'd been breech just a week previous). Everything was already sore but Baby B was smaller, so he was easier to push out despite the tenderness. He was a little blue, so he had to get oxygen before I could hold him. Cort was born at 4:57. Once again, Paul cut the umbilical cord. They told me Reid weighed 6 lbs. 14 ounces. Cort was 5 lbs. 12 ounces. Both were bigger than their older brother when he was born. Dr. Walsh had me deliver the placenta, and I asked to see it, weirdo that I am. He was all excited that I was curious. He gave me a lecture about what an amazing organ it is. You could see both umbilical cords. Then I got stitched up for a tear. I went ahead and got lidocaine for that. The tear wasn't too bad but seemed like it took forever to stitch. At least I got to nurse the boys while being stitched. We took a bunch of pictures. Reid latched right on. Meanwhile, I was bleeding pretty heavily. All over Paul's favorite shirt that I'd swiped (we got the blood out but still refer to it as the hemorrhage shirt). They moved me back into my original labor room. Still gushing blood, so I got a shot of pitocin and they were really working over massaging my abdomen. When the bleeding still wouldn't stop they called Dr. Walsh back in. I knew from my obsessive online research of twin births that hemorrhage is very common after birthing twins. Dr. Walsh went up inside (oh so painful) and at the same time they were massaging on the outside. After working me over, he pulled out and then had me ‘deliver’ about 6 large blood clots. Seriously, they had me push them out. They were like the size of double whoppers. Ick. Finally, I was left to recover. In all my imaginings of what labor and delivery might have been like, I never would’ve imagined anything like this. It was absolutely perfect, to tell you the truth. I wouldn't change a thing. 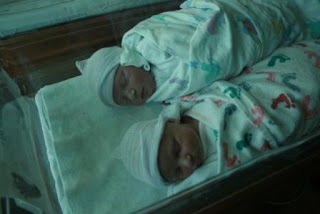 Two healthy boys, an all natural birth, and what would be an easy recovery. If you missed the pregnancy story, click HERE to read about the 3rd trimester with twins. I am so excited you got to birth them vaginally and naturally. You really must have given that resident something to think about! LOL, you probably did hear the screaming ;-) Luckily, that part went really fast (like all of it) and was probably only 5 minutes or so. Such a wonderful story!!! You did such a great job. For me, it was an out of body experience getting to hear the twins cry for the first time. I kept telling my husband, "We made two! We made two!!!" I cried for hours with pure joy. WOW!!! What a great birth story : ) Great photo of you, your husband and the boys right after you gave birth!!! A little late to the party here. My son was with an epidural and it took forever and everything went wrong. My daughter was with a doctor who hated women so a nurse hid me in a closet in the hospital. Daughter was a natural birth due to the obvious - closet, hiding, horrible doctor. She went much easier all in all, aside from the closet. I feel the same as Jeremi--WOW!!! You're amazing! I've never know anyone to have twins natural! What a hard, but wonderful experience!